Experience with Windows 7 Home Premium so far. This post is about my short term two week review of Windows 7 Home Premium, and tutorial for Windows 7 Home Premium upgrade edition where you learn about the key improvements, new programs, positives and negatives of 7 and use ability of Windows 7. My article has plenty of screen shots, animations, and explanations since an Operating System is a visual experience, so it is essential to know how an OS looks before buying it like a car. It does not only take you places, it should also look nice. 320 GB SATA2 Hard drive. 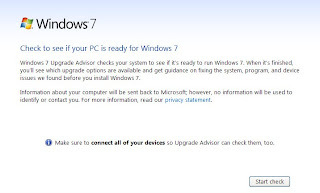 I download and installed the Windows 7 upgrade advisor to see if I can run Windows 7 on my PC. Windows 7 upgrade advisor said, "I can upgrade my Windows Vista Home Premium OS to Windows 7 Home Premium OS"
Upgrading from Windows 7 is simple. All I had to do is buy and download it from http://www.win741.com/ pay $39.99 Canadian for the student edition and ran an .exe file I downloaded from win747, and agree to the 7 terms of service, and wait for the installer to upgrade Vista to 7. Windows 7 is decently price for students, but expensive for non-students, so I recommend buying a PC preloaded with 7, or an OEM version of 7. The biggest improvement I notice from Vista is the computer start up, shutdown, hibernate, wake up and sleep speed. It takes less then a minute to start up my PC, or put it in a power saving mode. It only takes a few seconds to wake up my PC from hibernate or sleep. My security software which are MS security essentials and SUPERAntispyware loads up very quick at start up. 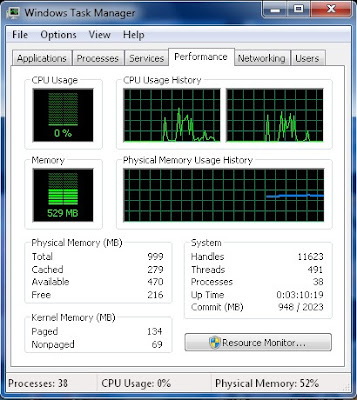 It also takes less time to load up programs like a web browser, and MS Office 2007 compared to Vista. 7 also does not use RAM as aggressively as Vista. Before I switch to 7 Home Premium, my web browser which is Avant browser would use 400MB or more MB of RAM. Now it only uses under 200MB of RAM most of the time. All my software, and hardware I used in Vista work in 7 after the Windows 7 upgrade. Windows 7 also does not cause my hard drive to thrash as much after a Windows Update or regular use. My PC seems more quiet now because I hardly hear my drives spin a lot like when I used Vista. I also been using Hibernate more since my Windows 7 upgrade. It takes only about 30 or so seconds to start back from hibernate mode compared to minutes with Vista, so I'm saving more power, too since hibernate mode uses no power. Plus, I won't lose my work because of a power outage unlike sleep or ON mode which I will lose my work if I did not save my work. Hibernate saves all my work, and returns my PC back to normal when I turn it back on.